The value of a Jew who safeguards the regularity of his learning sessions is inestimable. The following wonderful story happened to a member of a daily Talmud class in Bnei Brak. I heard the story from a certain renowned Torah scholar who, over the course of many years, delivered daily classes on the Talmud. In his group was a man whose seat was never empty despite many troubles. Rain did not stop him from coming, nor the fierce heat of summer. Day after day he appeared at the class, with unparalleled consistency. One day, circumstances arose that made it impossible for that individual to attend the class. Not wanted to miss out on that day’s page of Talmud, he did his best to sit down and learn it on his own at home. He came across a difficult commentary from Rashi, but refused to give up. He tried to answer all of Rashi’s questions, straining to understand, to find solutions, thinking and thinking…until he fell asleep. The next morning, the man went to his teacher and related the dream. As a side point, he also outlined the explanation of Rashi that he and the old man in his dream had to come up with together. The rabbi became very excited. He led his student over to the bookcase and took out a holy book containing the Rashba’s Torah thoughts. There, in black and white, was the exact explanation that the old man with the noble countenance had told him. The man who had identified himself as…the Rashba. To me, the teacher emphasized his trust in the story, saying that his student was a man of integrity who could not be suspected of lying or exaggeration. Moreover, the fellow was incapable of learning a Rashba on his own. Unless the Rashba himself (!) had truly revealed himself in a dream, and explained the matter appropriately, how had the man come up with the explanation? 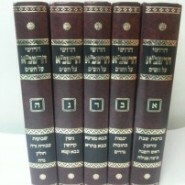 Reprinted from Aleinu L’Shabei’ach from Rabbi Yitzchok ZIlberstein (written by Rabbi Moshe Zoren) Artscroll.